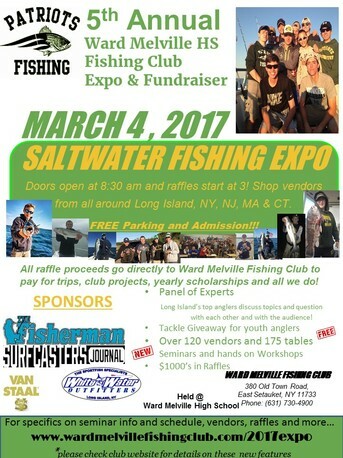 Suffolk Marine will be at the 5th Annual Ward Melville HS Fishing Club Saltwater Expo and Fundraiser. Doors open at 8:30 AM. This is a FREE event that will house over 200 tables of vendors and exhibitions from NY, CT, MA, NJ and NC. There will be 12 seminars conducted by local captains, guides and sharpies as well as hands on workshops aimed towards our youth anglers but appropriate for all attending. ​Do not miss the PANEL OF EXPERTS, a very unique Q & A session with some of the regions top anglers. Special YOUTH TACKLE GIVEAWAY for anglers 5 to 20 yrs old. There will be a raffle of small and big ticket items to raise money to help fund the activities of the club throughout the calendar year. Refreshments and snacks will be available at the show as well.